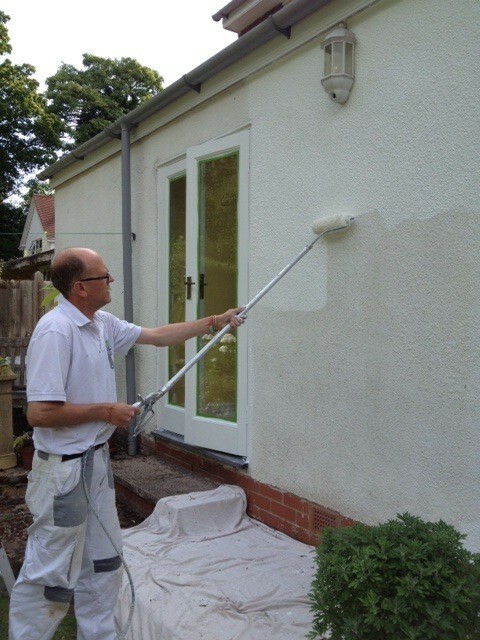 This is Ron Taylor’s second blog on the subject of exterior painting tips, and he goes through two different jobs, completed back to back, with different requirements. Both properties were on main roads. The first one being set back behind a line of trees, the other directly on the street. If I was using an oil-based finish, I could have used the same trim paint for both. But as I only use water-based topcoats, different products were required. Though the windows on the first property were fairly new, the fascias and soffits had had years of paint applied, some good, some bad, so there were areas of uneveness. We therefore thought a satin finish would be preferable on the entire job. The second house was not at all sutable for a satin finish, due to the close proximity to the main road. Though a satin or eggshell finish would last without flaking or peeling, it would get dirty very quickly, due to the flatter finish, which would hold onto the road dirt and exhaust dust. For the first project I went with Johnstone’s finishes, QD Satin Opaque for the trim and Stormshield Masonry Paint for the render. I had used both products before with good results. The Stormshield applies and covers well for a reasonable price. 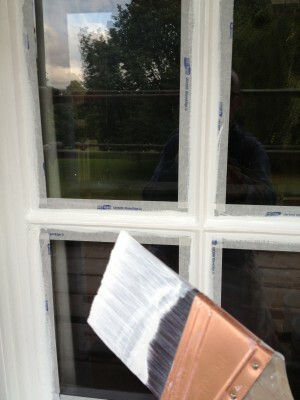 The QD Opaque is similar to Sadolin Superdec but I find the opacity to be much better. It’s also more readily available and tintable to more colours. The second job had been painted by me with Sikkens AZ Gloss about 7 years ago. It’s the one and only time I used this product and I didn’t want to use it again. I can’t fault the finish, but I found application was a chore. I couldn’t get it to apply easily and found it would run, given the slightest oportunity. The finish of the AZ though is very hard, making it difficult to sand dull for applying water based finishes, so I decided to go with a coat of Zinsser Cover Stain, prior to two coats of finish. The finish had to be glossy with a smooth, slick finish, which isn’t always easy to find with a water based exterior paint. I had intended to use Sadolin Superdec Gloss or Mythic Semi-Gloss but a conversation with Ben Sturges of Paints & Interiors put me on to Eicó Paints, from Iceland. I ordered some of their Alterior Gloss, which is interior/exterior quality. On both jobs, I sprayed the trim with Krud Kutter Original from a bottle and rinsed off. On the first job I rinsed it off using an airless sprayer with a 517 tip. This isn’t the way I usually do it, in fact my wife did most of it, but the sprayer was there, and it was easy. 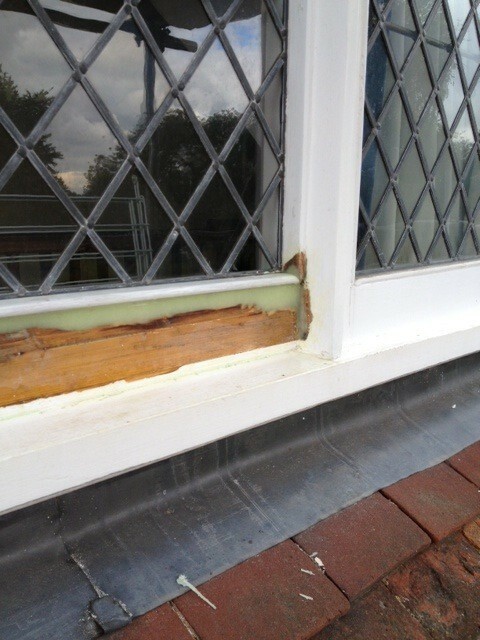 Both jobs were prepared thoroughly, followed up by using using Repair Care resins on any rot. Because my paint was purely water based on the first job, I used XIM Peel Bond for bare and bad areas. 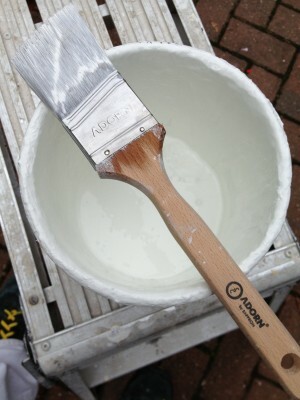 I used a little of this on the following job, but because the primer was oil-based I only used it sparingly. I then overcoated it with Johnstone’s Ultra. Peel Bond isn’t compatible with oil products. The masonry paint on the first job was applied with a brush and power roller attachment to my airless sprayer. Spraying and backrolling (to work the paint in) would have been faster, but spraying exteriors can be extremely problematic. The close proximity of neighbouring houses and parked cars can turn a quick job in to an expensive problem very quickly. The power roller saves time but gets very tiring after a few hours, especially if you aren’t using it on a long extension. This was the case on the side walls as the extension isn’t adjustable and would have hit the side fences. All of the cutting in of the masonry was done with an Adorn angled sash I was testing. This performed extremely well working paint into the uneven surface and the cutting was sharp. 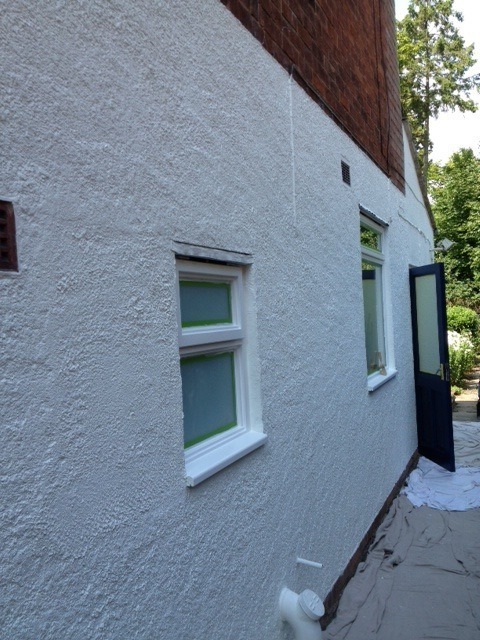 The trim was given 2 coats of Johnstone’s Trade QD Opaque, white windows, blue doors. This gave the desired opacity and finish. The blue finish contained a lot of pigment and would have struggled to cover a lighter colour in 2 coats though (this was going to be the same sort of colour again) but this is fairly standard for deep colours nowadays. The windows were painted with a Corona Ryan 2.5″ brush and the doors and fascias using another Adorn brush, a 2″ Dupont Tynex model similar to a Purdy Elite. Both brushes performed very well for their chosen tasks. Being a hybrid the Johnstone’s will tolerate a stiffer brush, as brushmarks tend to flow out. A quick word on the windows: I am a great fan of using tape on interiors, but up until this year hadn’t really considered using it for exterior glass until talking to a couple of colleagues. It may look like a money loser and the purist might snigger at the thought. But when you pull that tape you have a build up of paint on that edge you would never get with a brush cut and you have a dead straight line. You can also paint the window twice as fast. Try it once and see. Great blog, as usual from you. I totally agree with problems of dirtying with houses near main roads. It’s for this reason that I painted masonry sills with Bedec Soft Gloss recently on a B&B on a busy road. I could see the old masonry paint had really picked up a lot of dirt on the tops of the sills particularly. It was Sikkens AZ on the windows. You used Johnstone’s Ultra as a primer on one property, and Zinsser Coverstain on the other (if I read correctly). Was there a reason for this? 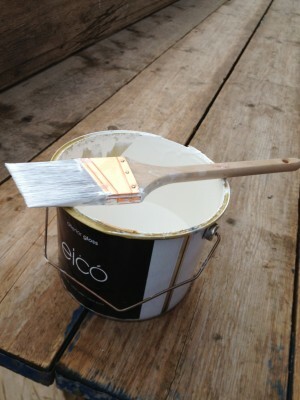 Do you see the Eico paints as being a new top choice for exterior gloss work? I’ve tried using masking tape on windows, but I’m not sure about the thick paint edge it can leave – particularly after 3 coats. How do you comabat this? Or do you think it looks okay when you do it? I only used the Ultra primer to overcoat the Peel Bond on the second exterior, the rest of that job was painted with Cover Stain prior to the topcoat. That’s because XIM only recommend overcoating Peel Bond with water based product. The first job was patch primed with Peel Bond and then just given 2 coats of Johnstone’s QD Satin, this is self undercoating. The thick paint edge was not a problem, in fact I feel it will help wear, as that is one of the first areas to fail on a lot of exterior paint jobs due to the thin build up. I think the Eico product would be an excellent choice for interior and exterior projects, but the 3 coat system, unless you are overcoating water based paint, could make it expensive on exterior projects. Taping the glass, especially on Georgian windows, does save a lot of time in the painting process, so this could offset some of the labour involved in cutting in the glass. As with everything though I think it’s best to buy a small amount of the product and try it out on a small job before committing to a big project with it. Painters who prefer the high shine of oil paint won’t be won over by the Eico. But water based converts should certainly do a little research on the product in my view. Masking tape on glass?? I would turn in me grave if i was dead Ron. Nice clean lines- yes. Glazing seal – no. What ever your happy with and works for you i cant question. It just goes against the grain with me. Mind you i still wont use use waterbased paints on exterior woodwork, so what do i know? Are you not a fan of sikkens satura on exterior woodwork? I tried the Sikkens Satura and AZ a few years ago on back to back jobs. I found the experience to much like hard work for my taste. I couldn’t fault the finish but I just don’t like using it. The taping of glass is something you will either like or hate. I just found it so easy and the results so good, I doubt I’ll cut any more in ever.